I am sitting on my flight from Sapporo to Tokyo, about to take off. I got up at 07:30, had a shower, and packed my bags to leave. After a quick FaceTime chat with M., I checked out and left the hotel. 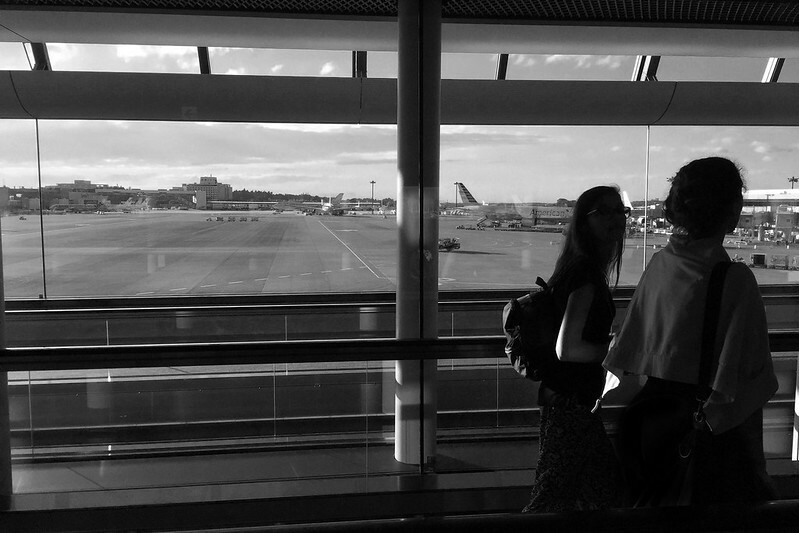 M. was leaving for the airport in Sydney at the same time, for our converging flights to Boston. I got some rice snacks from the convenience store near the hotel and ate them sitting on a bench in Odori Park. While there, a huge suite of people came through the park, armed with extension claws and plastic bags, picking up any and every tiny scrap of litter from the paths, grass, and garden beds. Now it’s clear how they manage to keep the park so spotless. I had a bit of time to kill before heading to the airport, so I walked a few blocks to the Hokkaido University Botanical Gardens. These opened at 09:00, and I was there a few minutes early, but there were already a handful of people waiting ahead of me. The gates opened right on time, and I bought a ticket from the machine for 420 yen. Then I asked the lady at the counter window if I could leave my luggage there, as it was too big for the provided lockers, and she happily took it inside the little office for me. 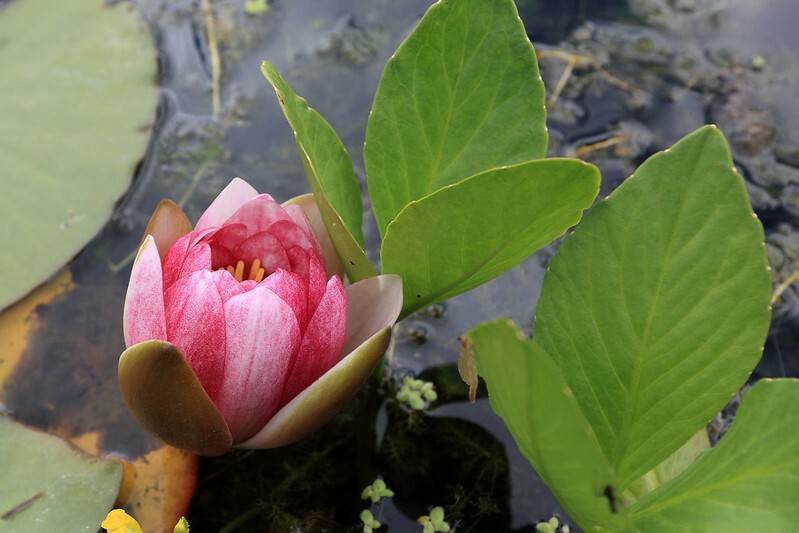 Water lily, Hokkaido University Botanical Gardens. I had a walk pretty much around the entire garden, which covers roughly nine city blocks. It was landscaped in a very natural looking way, with the paths just being stony or dirt trails through the grass, a bit muddy in places with the rain this week. It was all really beautiful, with large trees providing a lot of shade, smaller trees with flowers, particularly lilacs, and shrubs and bushes all over. 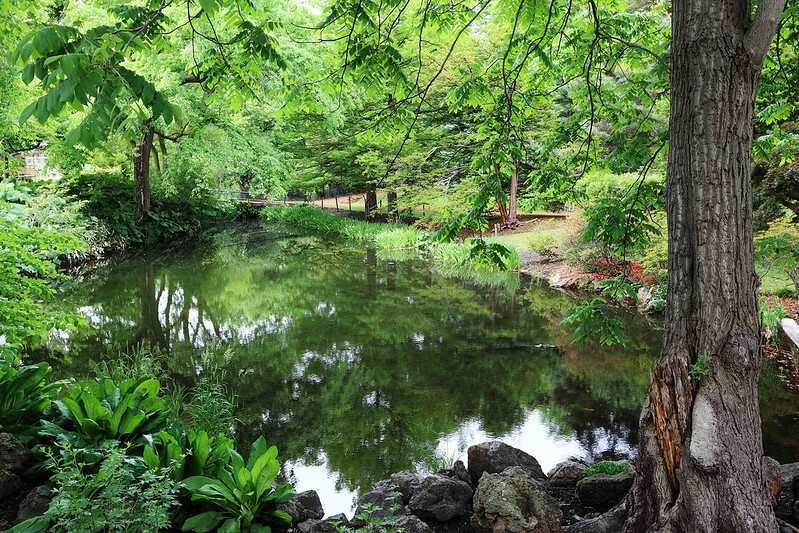 There were a few ponds and bridges over them, with calm water reflecting the foliage overhead and providing a place for reeds and lilies. Irises were in bloom in various places. There was a rose garden, but it was a little early in the season and only a few roses were in flower. Amongst all this there were birds flitting around, including quite a few large black crows with fat beaks. There was also a shrub garden, an alpine garden, and a “Canadian rock garden”. 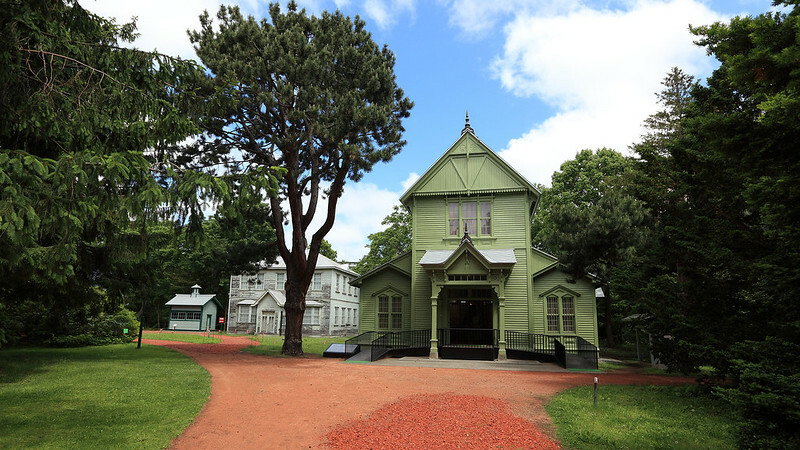 Natural history museum in the Hokkaido University Botanical Gardens. In the grounds were a few buildings, including some old wooden buildings which signs indicated were national historical sites. Inside one of these was a small natural history museum with a lot of stuffed animals from Hokkaido, including a bear, deer, seals, otters, wolves, a wild cat, and a lot of different types of birds. There was also the stuffed body of Taro, an apparently famous Sakhalin Husky sled dog who served in Antarctica, together with several photos of him when he was alive. Nearer the garden entrance was another building with displays of artefacts from the founder of the gardens. And on the second floor of the entrance building itself was a museum of the local native Ainu people and culture, which had lots of artefacts including clothing, tools, weapons, and ornaments. All of this was really good, and the gardens were well worth a visit. I rushed through in a bit over an hour, but you could spend a couple of hours here at a more leisurely pace. 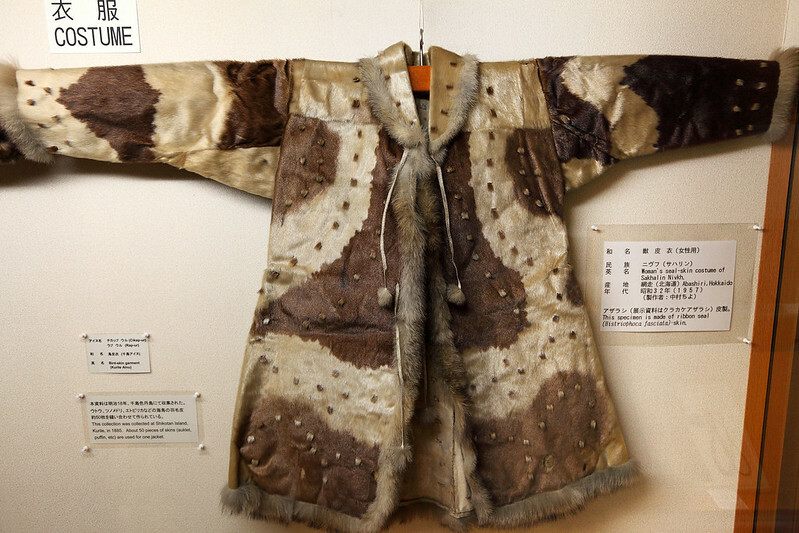 Ainu sealskin coat, Hokkaido University Botanical Gardens. From the gardens I walked over to Sapporo station and bought a ticket for the express train to New Chitose Airport. One was leaving just a couple of minutes after I bought my ticket, and I managed to make it to the platform in time and boarded just before the doors closed. It wasn’t completely full and I managed to get a seat, even though a handful of people were standing already. At the airport I had to figure out where to check in, as it wasn’t obvious because my flight was booked through JAL and had a JL flight number, but operated by Jetstar Japan. 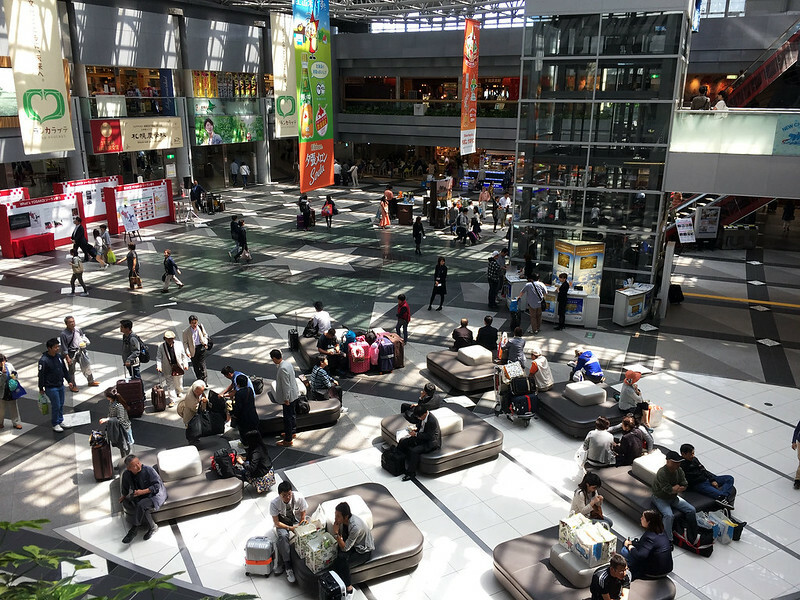 I asked at the JAL counter and a lady there told me I had to check in at Jetstar, which was a long walk way down the other end of the enormous domestic departure terminal. Thankfully this information was correct and I checked in okay. I have to check in separately at Narita for the Boston flight. The check in lady asked if I was okay with an exit row seat, which I happily accepted. I had quite a while to wait before boarding, and it was lunch time, so I wandered around the nice new terminal building to find somewhere to eat. The terminal looks brand new and has a huge number of shops and restaurants. I thought about a sit down restaurant, but found a food court which had a place making delicious looking takoyaki balls. I ordered a set of 12 balls, which the lady told me would take a few minutes to cook. I ate them at a table with a bit of a view out over the runways. While there I connected to WiFi and checked messages. There was a message from M. saying that when she got to Sydney airport she discovered her flight had been delayed by nineteen hours! She had to go back home again and wouldn’t leave until the next day! So we won’t be arriving at Boston on the same day any more; I’ll have to go in the next day to meet her. After finishing my takoyaki, I wandered a bit more, checking out Royce’ Chocolate World, which was an actual chocolate factory right in the airport terminal, with big glass windows letting you watch them making various chocolates. They also had a display of the history of chocolate and how it’s made, with a fake cacao tree and all. Near there was a Starbucks, and I bought a Hokkaido mug to send to Allison for Hailey’s collection. 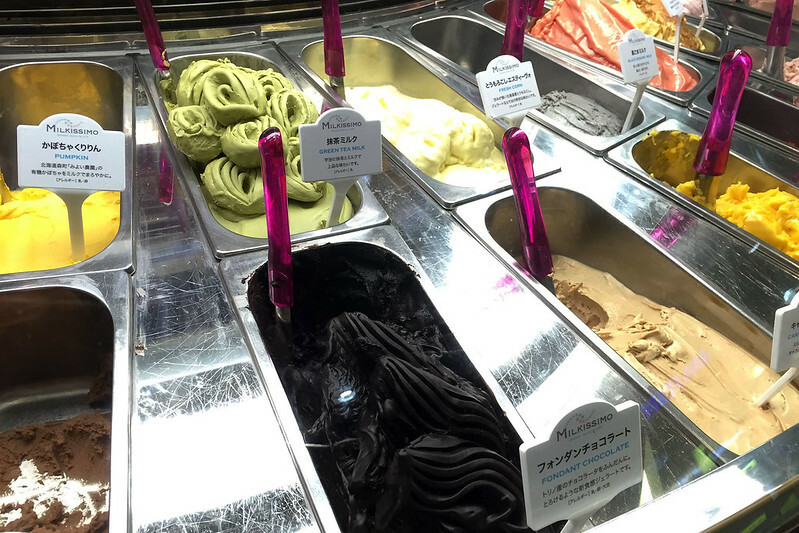 Chocolate fondant gelato from Milkissimo, New Chitose Airport. Earlier I’d passed a gelato stall, called Milkissimo, and went back for something sweet to use up as much of my remaining yen as possible. It turned out I was just a few yen short of a double flavour cup, so got a single flavour, which was a shame as I really wanted to try both the black sesame and an incredible, almost totally black looking chocolate fondant flavour. I opted for the chocolate fondant, which turned out to be a good choice, as it was incredibly rich and thick, and totally unlike any other chocolate gelato I’ve had before. I bumped into both Ken Parulski and Tom Osborne wandering around the terminal in different places. It turned out Tom is on the same flight as me, so we went to the gate together to wait for boarding. I’m on the flight from Tokyo to Boston. I have a bulkhead seat, with an empty seat next to me, then a young couple with a baby, who had been quiet so far, so no troubles there. The flight to Tokyo from Sapporo was uneventful. Jetstar sold food on board, and I didn’t even get a cup of water. At Narita, I went straight to a waiting shuttle bus from terminal 3 to terminal 2, where I went up to the departure floor to check in. This took a bit of time, but I managed to get this bulkhead seat with plenty of legroom, which is good. I had some time to spare, so I wandered around the shops a bit. At the Akihabara store, lots of people were buying gift boxes of sweets. One in particular was Tokyo Banana, which were flying off the shelves as people grabbed them, as fast as a guy could run back and forth restocking them with an armful of boxes each time. As quickly as he went away to get more and came back again, the lots that he just put there on the shelf were gone as people snapped them up. They must be popular sweets! 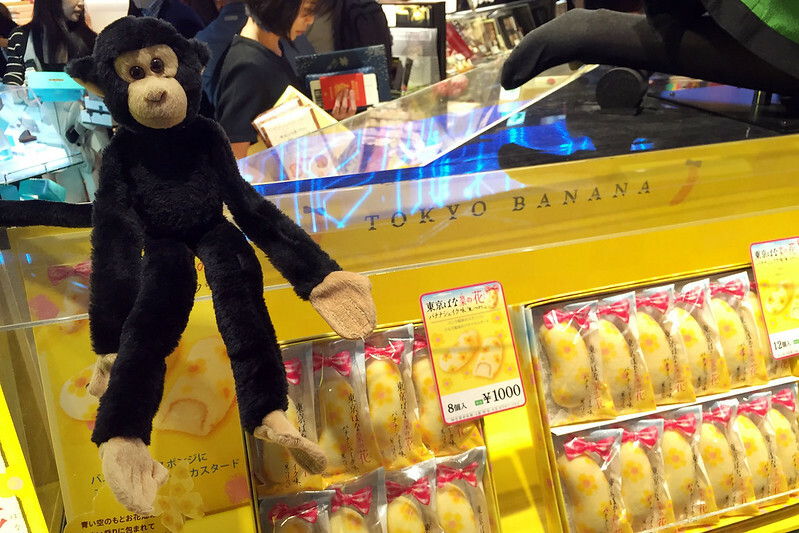 Monkey likes Tokyo Banana. Narita Airport. I stopped at a cafe where I could charge my iPad, halfway to the gate lounge, and got FaceTime to work for a quick chat with M., who should have been on a plane herself by now, but was stuck at home waiting for her delayed flight. Then I went to the gate and boarded the flight without too much delay. Flight time to Boston is 12 hours, with a predicted landing time before 18:00. 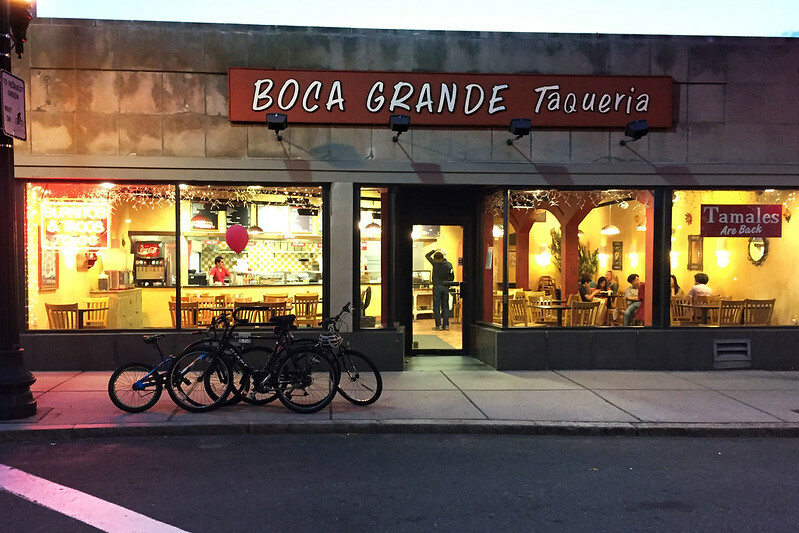 I landed in Boston, I escaped through customs, I negotiated the airport shuttle bus to the T station, and then the trains to the Holiday Inn hotel in Brookline, checked in, went for a short walk to get dinner at a nearby taqueria called Boca Grande (“big mouth”), had a shower, and am about to crash into bed. I had chicken ranchero enchiladas for dinner, which was good and amazingly cheap at just US$7.25. I’m going to sort everything else out tomorrow morning. This entry was posted on Saturday, 31 October, 2015 at 17:22	and is filed under Diary. You can follow any responses to this entry through the RSS 2.0 feed. You can skip to the end and leave a response. Pinging is currently not allowed.